Gimmick – an ingenious or novel device, scheme, or stratagem, especially one designed to attract attention or increase appeal. The picture book gimmick is the twist, the mash-up, and the familiar story told in a new, unique way. Not all picture books have a gimmick, but when they do, I’m often impressed with the clever spin the author put on the story. I also find picture books with a gimmick get a lot of attention. 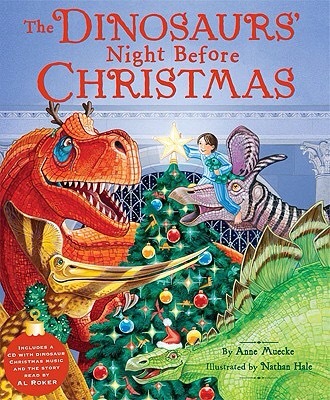 Yesterday I brought home the book, The Dinosaurs’ Night Before Christmas, written by Anne Muecke and illustrated by Nathan Hale. You don’t need anything more than the title to know this picture book’s gimmick. The author strategically chose to take a familiar, holiday picture book story and replace the usual cast of characters with dinosaurs. A clever gimmick that gained the attention of an editor. Now dino-loving kids on Christmas Eve have a new story to love. Have some fun discovering the gimmicks in your favorite picture books, and try writing a positively gimmicky manuscript of your own. This entry was tagged Gimmicks, Picture Books, Writing. Bookmark the permalink.